Air potato (Dioscores bulbifera) is a perennial, herbaceous self-twining vine that can grow over 60 feet in length, enabling it to climb over and smother many native plants. 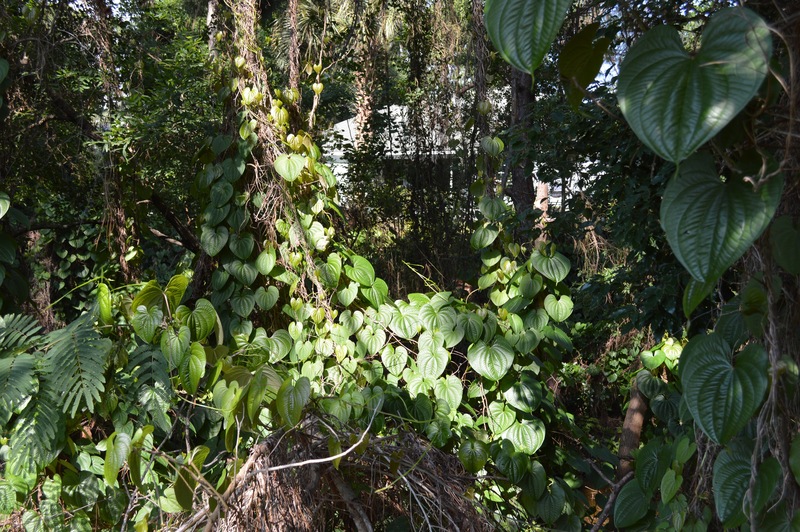 The Florida Exotic Plant Pest Council (FLEPPC) lists air potato as a Category 1 invasive plant, which means that it has disrupted natural communities and ecological functions by displacing native plant species. In 2012, a leaf feeding beetle (Lilioceris cheni) was introduced into South Florida from China for biological control of air potato. Although it is too early to determine any potential long-term impacts, the initial results have been promising. The larvae and adults of the air potato leaf beetle feed on the leaf tissue and occasionally the bulbils. The damage to the growing tips of the plant have dramatically reduced its ability to cover native vegetation. Extensive damage to air potato was evident within three months after the first release. Additionally, testing by scientists at the USDA/ARS Invasive Plant Research Laboratory in Fort Lauderdale concluded that the beetle will not complete development on any other plant found in Florida. The female air potato leaf beetle lays an average of 1,200 eggs, which develop into larvae in about four days. The young beetles skeletonize the air potato leaves for the next eight days and then pupate into foam-like cocoons. Clumps of cocoons fall to the ground and the adult beetles emerge 13 to 16 days later. 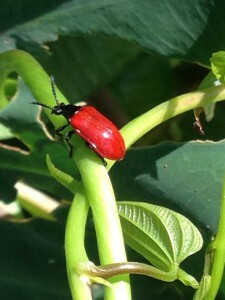 There can be a new generation of air potato leaf beetle every month while the weather is warm. For the winter, the adults hide in leaf litter and wait for spring. The question now is: “How well will they survive through a longer, colder Northwest Florida winter?”. USDA scientists, UF Extension agents and citizen scientists in Bay and Okaloosa County hope to find out. Earlier this month, June 2015, air potato leaf beetles from the Hayslip Biological Control and Research and Containment Laboratory in Ft. Pierce were released into areas containing air potato. They will be monitored over the next year. Look for an update this coming summer.